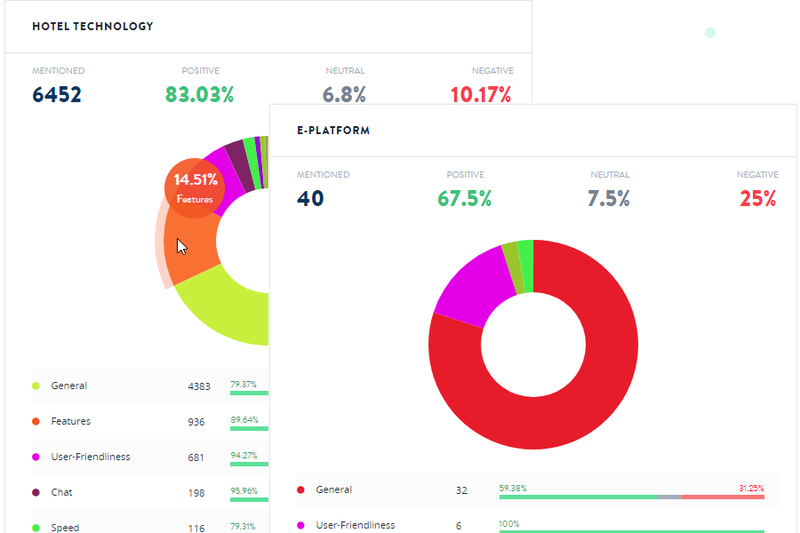 A lot of feedback platforms use text analytics as an add-on after a traditional survey. We can do better. ISAAC is the intelligent engine behind the whole of the Hello Customer platform, we built everything around it. It enables companies to do what they've been dreaming of for years: to truly put the Voice of the Customer (VoC) first. Instead of opting for multi-question surveys, we believe in the strength of open feedback. Because of its intricacy and accuracy, ISAAC only needs one question to deliver the meaningful customer insights you need. This is what makes us unique as a CX technology platform. Without an ISAAC by their side, companies will remain stuck in an endless cycle of surveying without ever making an impact. 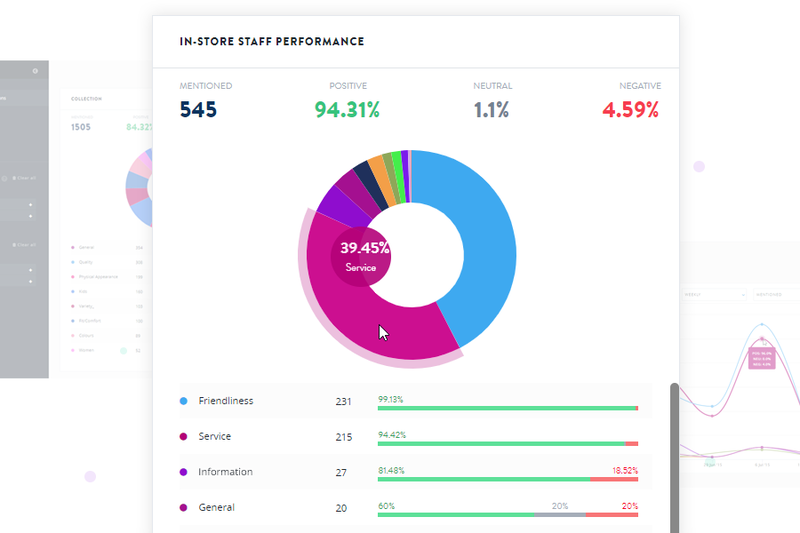 ISAAC automatically categorizes collected feedback into the key business aspects of your industry at a 92% accuracy rate, leaving the need for endlessly long analyzing processes behind. Behind it is a team of clever Data Scientists at Hello Customer and the University of Ghent. Gone are the days of word clouds and generic insights. 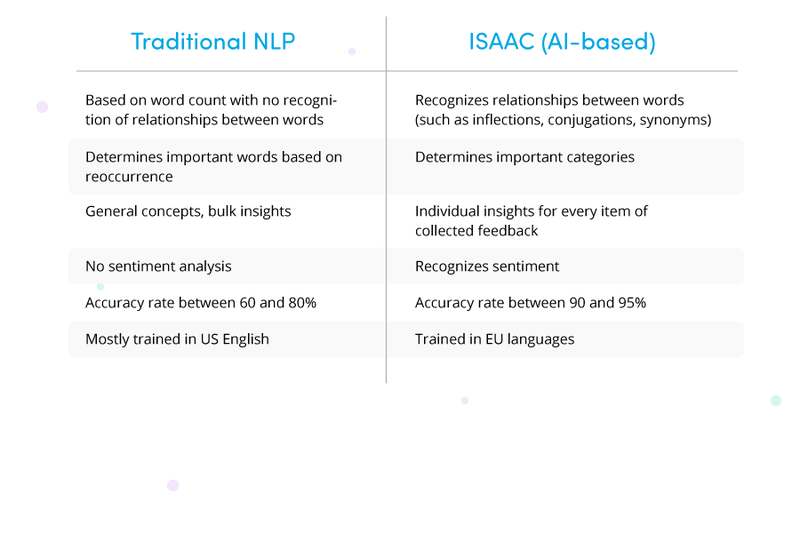 In contrast to traditional NLP, ISAAC can understand specific concepts and tell you what every piece of individual feedback really is about. Turn every piece of feedback into a conversation. Want to know how our customers use it? 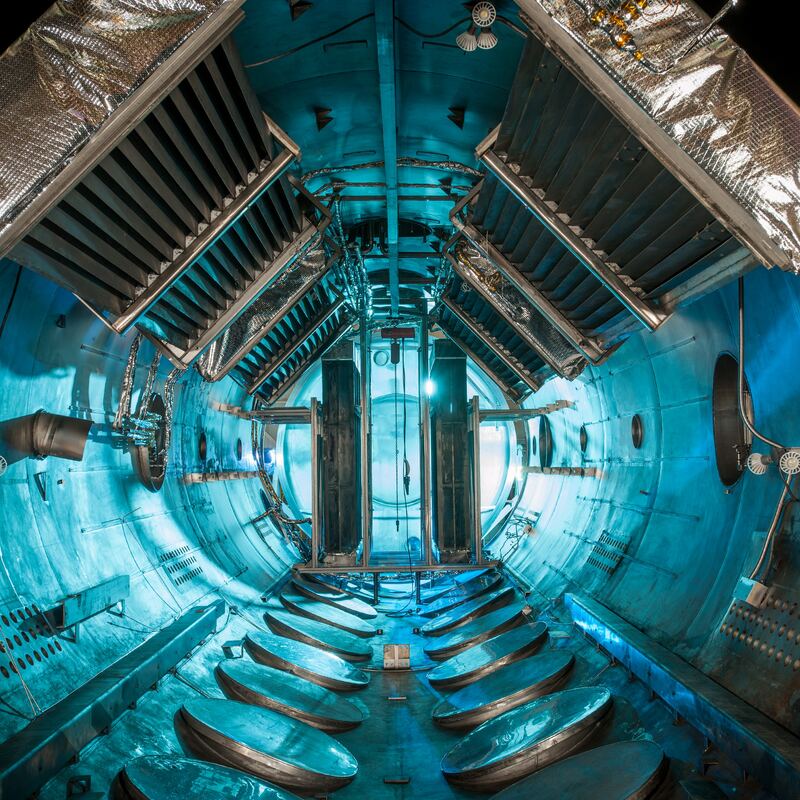 Discover the story of Colora here! ISAAC has been multilingual from the beginning. Considering we're at the heart of Europe, it has been trained in a wide range of official EU languages such as Dutch, English, German, French and Spanish. 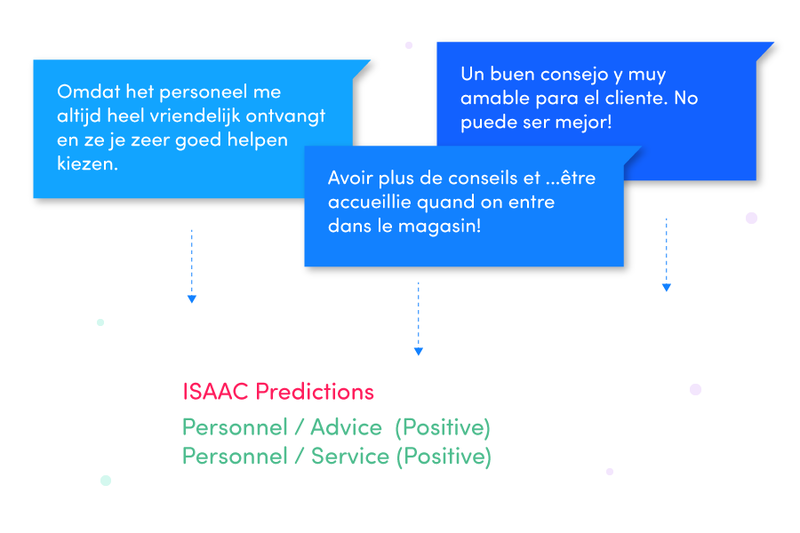 With ISAAC, language is no longer a barrier and you can easily target different markets. If you always wanted to know what people feel when they write about your company, ISAAC is the way to go. After ISAAC has performed its magic, the output is highly detailed and accurate. Every piece of feedback is transformed into a prediction, containing specific main and subcategories, accompanied by a sentiment. Certain customer topics reoccur throughout different industries, that's why we can guarantee a high level of accuracy that will never drop. However, ISAAC can also be used as an empty container for your unique organization and analyze context-specific data. ISAAC only keeps getting smarter and smarter. Our AI has multiple features to streamline your feedback processes from A to Z. Because ISAAC recognizes specific categories and sentiment, feedback reaches the right person and a notification is sent right away. Use insights from feedback analysis to establish a conversation flow, and get back to your customers with correct follow-up questions. Get in touch for a demo on your own feedback data!